I'm not quite sure what I did before I discovered Butternut Squash. It has to be the most versatile of vegetables, that sweet, firm flesh goes so well with so many different flavours. 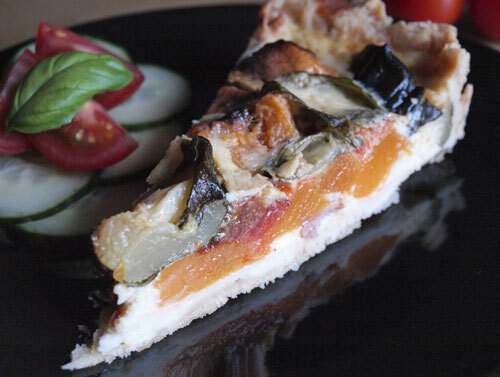 I combined the squash with tomatoes, bacon and basil in this tart with a single small courgette from my garden which needed to be used up. As I am trying to cut back on calories, I used 0% Greek yogurt in the custard mix and it worked really well. I had very positive comments from the family about this tart. Vegetarians can just leave out the bacon with very little detriment to the texture and flavour. 1. Peel squash and deseed. Cut into even sized pieces and put into a roasting tin. 2. Cut tomatoes in half and slice the courgette, place in roasting tin with squash. 4. Roast in an oven 200C for 30 minutes until the butternut squash is soft and slightly caramelised round the edges. 5. Chop the streaky bacon into pieces and spread over the vegetables, roast for a further 10 minutes until crisp. 6. 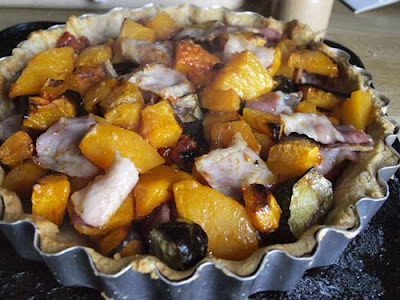 Place the vegetables and bacon into the pastry case. 7. In a bowl, whisk the eggs and stir in the 0% Greek yogurt, season with salt and pepper. 8. Pour the mixture over the vegetables. 9. Tear up the basil leaves and spread them evenly across the tart, push them down into the egg mixture. 10. Bake at 180C for 30 - 35 minutes until the egg mixture is set. 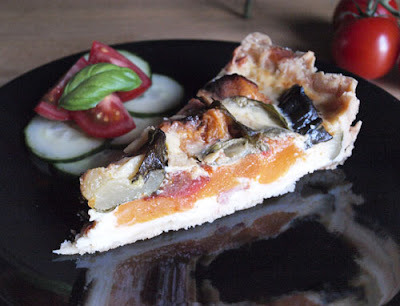 I'm entering this tart for Herbs on Saturday run by Karen at Lavender and Lovage. 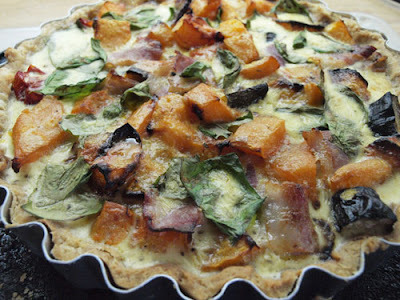 This tart looks lush! Love squashes of all kinds. Cut out the bacon and I say a big Mmmmmmmmm! You know I thought about you, Jac, when I put it in and nearly didn't - see what an influence you have over me! However, I needed to use it up so the thrifty cook in me just had to add it. Sounds really good - I love butternut squash! What an absolute stunner of a tart and a GREAT entry for Herbs on Saturday too! I also LOVE butternut squash, and remember my mum steaming them and then mashing them with butter when we lived in S Africa, where they are very prolific. This looks great (minus the bacon here too!)! Oh. this looks so good! Perfect fall entree! 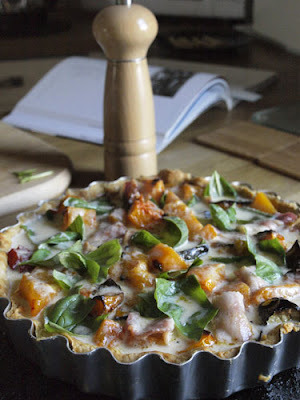 This looks great, I love Butternut squash and am waiting for them to ripen in the veg patch! This looks delicious! btw, I love your pictures. Making me hungry. This looks a lovely combination. I'm afraid I wouldn't leave out the bacon. I can't imagine life without butternut squash (or BNS as I've seen it described quite a lot lately) - it's the main ingredient of my standby midweek meals in one form or another. Hi! 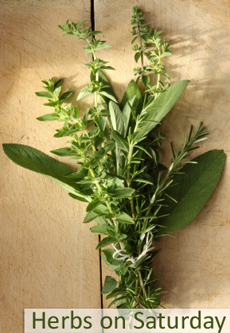 I am visiting via Herbs on Saturday. This looks absolutely delicious. I am fanatic about Butternut squash, they taste much better than pumpkin.